Mmm hmm….that’s right. Chocolate. Toll house. Bars. 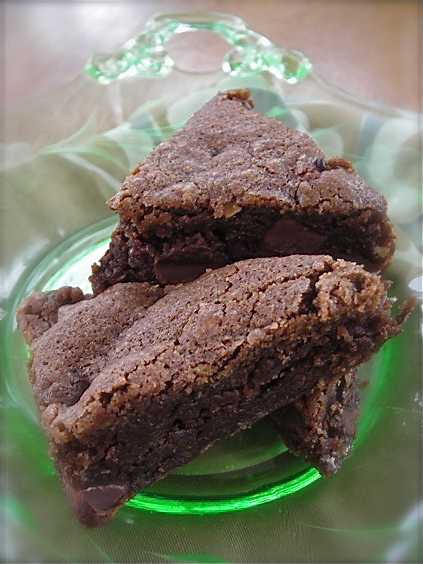 An unlikely sisterhood of fudgey brownie and the famous toll house recipe baked into a pan. I’m really a cookie lover at heart, but sometimes I just don’t want to scoop and bake repeatedly. Sometimes I just need to cream, stir, blend and fold myself into contentment, the end result being more easily achieved than what requires parchment, trays and repetitive movement. 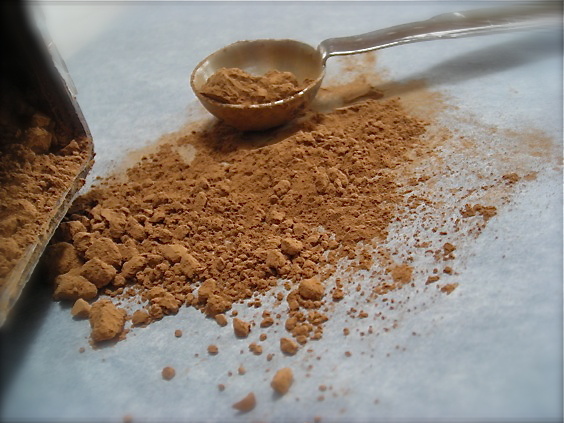 Take one recipe for your favorite version of a Toll House bar and stir some good cocoa powder into the dry goods. Take a bite and sigh with contentment. See? I would never steer you wrong. I can bake. I love to bake. My lifeline to my guardian angel, my mother, lies in my mixer and flour container. With a spatula. I have no fonder memories of her than baking with her, the sunlight streaming in her kitchen window. I should recall her laugh, which was loud and shrieky, I mean, have you heard mine? She caused that, no doubt. My brother too. When he and I laugh together, people cover their ears. They wince. We get asked to be quiet in movie theaters, and we shock people. But her laugh, while amazing and warm was just a blue ribbon pinned on the strong and capable woman that she was, and that I strive to be. I may bend in the breezes, or twist against the savages of life, but no matter what happens, I am still the person she raised me to be, no more or less. With a spatula in hand. And cookies. They were her favorite. She made pies, bundt cakes (ooh, lime green ones sometimes. Eeek.) and she made bars too. But cookies were her specialty. Now I could do without the nuts that she loved, and to this day I haven’t been able to abide by the walnut, so overpowering was that in my youth and usually rancid if I am able to judge now. She put it in everything, and I picked them out of everything. If I was woe to forget to throw them away, the pile left behind would elicit one of her pretend indignant shrieks of “KATE!! !” because she just knew me that well. It was always me who carefully and diligently despised her walnuts. Or maybe my siblings were just better at remembering to dispose of the evidence. One thing that Griffin does love to do is make cookies now and again. I like to keep everything on hand in case he gets a hankering for a homemade treat. The other day he was all set to make some Toll House bars when he discovered we didn’t have enough butter. With the saddest sigh that he could muster, he replaced all the ingredients he’d taken out and silently went upstairs. Mommy guilt overcame me. Although we had a few options available in the form of frozen commercial cookie dough, there is one thing that my teenager has inherited from me that sticks like glue: when he gets his mind on something he wants, he can’t settle for anything less. So the next day I went to the store and bought a lot of butter. Then when he was gone one night, I made a pan of bars and on a whim, added cocoa to the flour mixture. My mom is probably smiling right about now. The cocoa gives these familiar and comforting bars an added depth. While Toll House bars are nice and all, they really lack the pizazz of their more colorful and opulent baked counterparts. They’re reliable and sound but they’ve been left behind for everything sweet and dotted with sea salt, doused in browned butter, lavender essence and gold leaf. Oh Toll House, those new millenium treats smirk, you are so 1975. Place them on a table with something exotic, and the poor plate will get skimmed over. 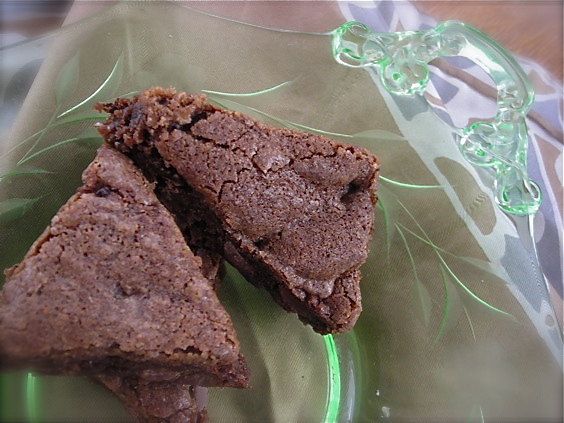 Turn it into a delicate brownie-like, cakey and soft square, and it will stand apart. If nothing else, it will just make your mouth pretty happy. In a less expensive way. And we like that, don’t we? by Kate, adapted from the original recipe. My version is a little different so read it through. Some new tips are included. Preheat the oven to 350°. Spray a 9×13 pan with cooking spray. In a large measuring cup, whisk together all the dry ingredients. In a large bowl, or a stand mixer, blend the soft butter and both sugars until fluffy and light. Be sure to really beat these well. The more air you incorporate into this, the fluffier your finished product. Beat it, scraping the bowl occasionally, for at least 5 minutes. Longer if you can. Add the eggs, vanilla and milk. Blend well. Now remove the beaters and scrape them into the bowl. Add all the flour at once, and with a stiff rubber spatula, begin gently folding it into the butter mixture. Remember to scrape across the bottom of the bowl and gently turn it over. Don’t stir it or you’ll deflate all that air you beat into the butter. Watch what you’re doing and when you’ve incorporated about half the flour, stop folding and add in the chocolate chips at this point. 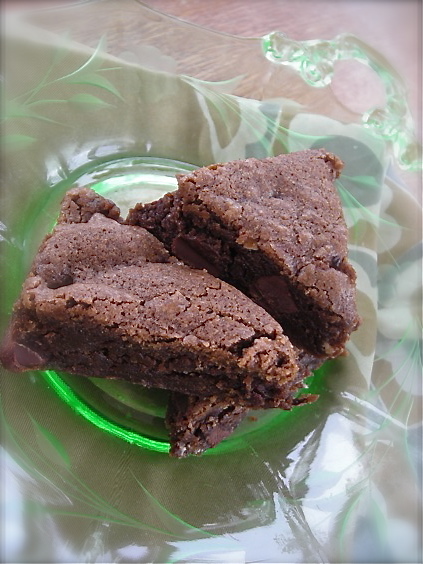 Continue to fold the remaining flour into the mixture, along with the chocolate chips. There will be a single magical moment when it all comes together in a beautiful glossy homogenized mass, and at this point, make sure there is no flour at the bottom of the bowl and then stop folding. Scrape it into the prepared pan and gently spread it to the edges. It’s fine if it doesn’t look perfect. Bake it for about 25 minutes, checking with a toothpick to determine if it’s done. Remove pan and allow to cool before cutting. I know that all recipes for these bars tell you to incorporate all the flour and then fold in the chips. Somehow this has worked for decades, but once you incorporate the flour, the more you stir and mix it, the tougher it will get and the bars will come out denser than you might expect. If you add the chips partway through the flour step, the finished product is lighter and you get more distribution of the chips. If you’re like me, you prefer your chip ratio to be even, not clumped up in some spots more than others. Even with the beating and gentle folding, these bars collapsed but they aren’t dense, just moist and fudgey. This recipe calls for less sugar than any recipe you’ll find in print. With the addition of the milk, and of course those chocolate chips, there really isn’t the need for that much sugar. I’ve realized as I get older and experiment with baking that many, many recipes are too sweet, and cutting back sugar is always a good thing, isn’t it? And yes, most recipes don’t call for milk to be added but if you follow this one, the additional cocoa needs to be balanced by a little more moisture, and the milk adds a nice touch, making them sweeter with a bit of richness. Experiment with what you have on hand. Flavored coffee creamers might be lovely to add a hint of something extra. And if they fall while they cool, no one will notice because they taste simply amazing. Especially for breakfast with some really dark coffee. I have to say this is now the fourth time I’ve read your website and Im likein it! I added your weblog to my rss reader. Hoping to see more updates! I really like analyzing your piece, I’ve also bookmarked your blog #for the# future and added it to my RSS feeds. Thanks! Oooo, I’ll have to make these. Maybe this weekend. Ah, Kate — a woman after my own heart. I’m a rule breaker by nature, and have been incorporating my chips earlier in the recipe for years. 🙂 Ah, Sweet Validation! HELLO! You use a lot of my favorite words in this post and in this recipe! I’m SO on board! I can’t wait to make these!!!!!!!!!!! Your post serendipitously collides with my strong craving for chocolate and my intolerance for the same old cookie. And what a beautiful serving dish!